Suitcases, a collaborative production helmed by Rosanna Saracino, got quite a warm reception last night for its opening. With a full audience, and a balmy shift in the weather, the Artscape Sandbox Theatre in Toronto was the place to be. 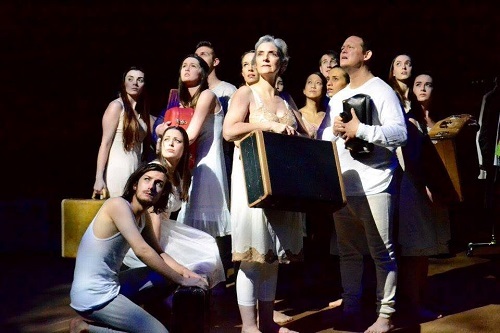 A piece of theatre that frequently crosses the lines of contemporary dance, Suitcases takes its inspiration from the 1995 closure of the Willard Asylum in New York State. An employee of the asylum had uncovered over 400 suitcases in the attic, belonging to patients who had been institutionalized there between 1910 and 1960. The suitcases, and their contents, became a fascinating source of insight into the lives of the patients and have since been meticulously documented by photographer Jon Crispin. Saracino’s Suitcases takes this documentation one step further, using monologues, evocative movement and clever prop and costume play to bring these long-lost patients to life. The production deals with a variety of subjects, all within the context of mental illness, abandonment, memory, and identity. What struck me as soon as the lights dimmed, was the impressive range of ages that made up Saracino’s ensemble cast. I think it could have been too easy to cast a bunch of talented, young actors, and I appreciated the choice to keep them varied. I also thought the ensemble was on even ground performance-wise. There were no actors who stood as particularly exemplary or weaker in their delivery. They were each captivating in their turn and there was no point where I felt the show was dragging. Saracino’s process of creating this piece was largely collaborative, with multiple playwrights lending text to the work, as well as the ensemble themselves. I think the characters became more tangible and realistic as a result of this process. Being hugely interested in dance myself, I found that I was incredibly drawn to the movement elements that choreographer Linda Garneau brought to the stage. From the sporadic twitching moments to the fluid repetitive motions, I appreciated the physical elements that echoed the internal challenges each character faced. One of the moments that I found really impactful involved multiple actors using their bodies and limbs to build inhuman creatures, as though to illustrate the monsters they felt were growing inside of them. Another moment was a monologue involving a character who could feel every single noise, from the hiss of a cockroach to the squish of her own eyeballs looking left and right. The actors became a chorus of these ordinary sounds, which made the world of the show all the more real. I almost wished they provided the soundscape for the entire piece instead of the pre-recorded sounds that were being used. Suitcases is a fascinating peek into the human psyche, and an attempt to look beyond the assumptions we make about those who suffer from mental illnesses. I think it’s an intriguing work, full of thoughtful elements, and well worth sitting through its 75-minute run-time. Photo of the cast of Suitcases by Brittany Clough.